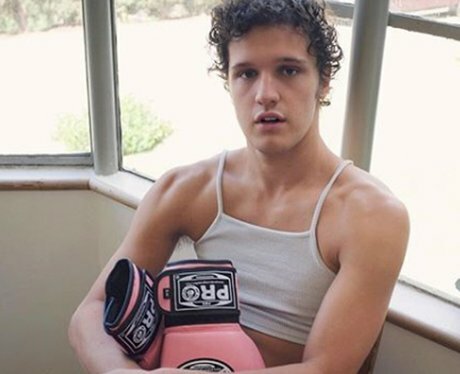 Antonio Marziale is quickly becoming a teen heartthrob thanks to his scene-stealing role as Elliott in 'Alex Strangelove' but there's plenty more to him. Find out his age, height and everything else about him here. 1. How old is Antonio Marziale? Antonio Marziale was born on April 5th in 1997. He is 21 years of age. 2. How tall is Antonio Marziale? 3. What is Antonio Marziale’s star sign? Antonio Marziale is an April baby. This makes him an Aries. 4. Where is Antonio Marziale from? Antonio Marziale was born and grew up in Pittsburgh, Pennsylvania in the US but his Mum is from Toronto, Canada. He even studied at Carnegie Mellon University there. 5. Who plays Elliott in Netflix's 'Alex Strangelove'? Antonio Marziale plays one of the standout characters in Netflix’s new hit film ‘Alex Strangelove’. Elliot is a confident, gay high school graduate who Alex fancies. Alex has a girlfriend though and hasn’t come to terms with the fact that he might not be straight. 6. Is Antonio Marziale friends with the ‘Alex Strangelove’ cast? Antonio Marziale is close to Daniel Doheny and Madeline Weinstein and the rest of the ‘Alex Strangelove’ cast. They have been friends ever since they met on set of the film and regularly appear on each other’s social media accounts. 7. Antonio Marziale is a huge 'Buffy the Vampire Slayer' fan. 'Buffy the Vampire Slayer' is one of Antonio Marziale’s favourite shows. He dressed up as Buffy for Halloween in 2016. 8. Is Antonio Marziale gay? Antonio Marziale is gay. He is also a prominent LGBTQIA+ activist and often supports and stars in queer media. 9. Antonio Marziale loves 'Stranger Things', 'Orange Is the New Black' and 'Chewing Gum'. Antonio Marziale has mentioned in interviews that he watches 'Stranger Things', 'Orange Is the New Black' and 'Chewing Gum' religiously. 10. Is Antonio Marziale in 'Altered Carbon'? Antonio Marziale plays Isaac Bancroft in the popular dystopian Netflix series 'Altered Carbon'. 11. Is Antonio Marziale in 'The Gay and Wondrous Life of Caleb Gallo'? Antonio Marziale starred in the beloved web-series 'The Gay and Wondrous Life of Caleb Gallo' as Benicio. 12. Antonio Marziale was in an episode of 'Supernatural'. In 2017 Antonio Marziale acted as Daryn Boston in The Memory Remains on the 12th Season of the beloved fantasy horror series 'Supernatural'. 13. Is Antonio Marziale on Instagram? Antonio Marziale uses Instagram regularly. Follow him on @tonimarz. 14. Antonio Marziale actually has a pretty good singing voice. Antonio Marziale is not a popstar but he is a really talented singer. He occasionally uploads covers of songs onto Instagram outside of his acting work. 15. What is Antonio Marziale going to star in next? Antonio Marziale is set to play the lead role of Danny Black in the new teen drama Ms Guidance.